Hey, TCF readers! Whitney here, and you all know by now that I love me some thrift shopping! I get asked quite often, “why should I start thrifting?” Yes, it’s true. There are some skeptics out there, and you may be one of them. It’s all good – I’m not mad at cha! AND YES, as a plus size thrifting CAN be done and done so well, with the right tools and tips! Remember my plus size thrifting tips? 1. You’re doing a good deed. Goodwill stores are NOT just “dedicated to transforming lives and communities through the power of education and employment.” I’ve actually attended their fashion shows in D.C. for 3 consecutive years and I can honestly say, they’re about giving back and providing jobs. Can’t beat that! 2. Create your personal style. There are a ton of items, spanning several decades, to shop for while thrifting. Have fun sifting through the racks and embrace the materials and designers, all while creating and honing your (unique) personal style. 3. Vintage style is always “in”. If you’re a vintage clothing connoisseur, you should be thrifting. Vintage options are beyond plentiful while thrifting. You can easily find rare, true statement pieces/items and I assure you, it’ll never go out of style. Trust me when I say, every closet needs a few good vintage statement pieces. 4. Great deals every time you shop. Forget about waiting for the holidays or clipping coupons. Thrift shopping allows you to score amazing deals every time you shop. Note: Most thrift stores have certain markdown/sale days too – just ask! 5. QUALITY. Thrift stores have a great selection of clothes made of materials like silk, cashmere, and sturdy cotton that will indeed last a long time. Check your local thrift stores for brands like Ann Taylor and Escada for the ladies and Brooks Brothers and Corbin for the gents. 6. Dress the Man in Your Life.With a variety of suits, ties, coats and dress shoes, affordable menswear is easy to find while thrifting. Although men’s clothes are usually more expensive than women’s clothes, you are still guaranteed to get some amazing deals! My husband thrifted a 2 piece suit, with the tags still on, at the Goodwill in Annandale, VA for $20. The suit was in impeccable condition. SCORE! 7. Perfect for collectors. Are you a fan of collecting items like vinyl albums, or crystal figurines? Your local thrift store is the place for you – It’s literally a collector’s paradise! 8. Great place to find a good book. Many thrift stores have a collection of cookbooks, children’s books, Bibles and more. It’s a great haven for book worms, like me! 9. Get your home in order. Furnishing and decorating your home can be pricey. So for certain home décor items, I say hit the thrift store! You’ll find everything from plates, placements, lamps and paintings. I actually found a set of dishes and salt and pepper shakers for just $8. All the dishes were intact too. 10. Have fun. Even if you don’t know what the heck you’re looking for, head to the thrift store for some fun. It’s always enjoyable to search through the thrift store’s treasures. You just never know what you’ll find! With the holiday’s right around the corner and the seasons changing, is the perfect time to get out there and give thrifting a try. Let us know if you do. We’d love to see what goodies you find! What do you thrift? 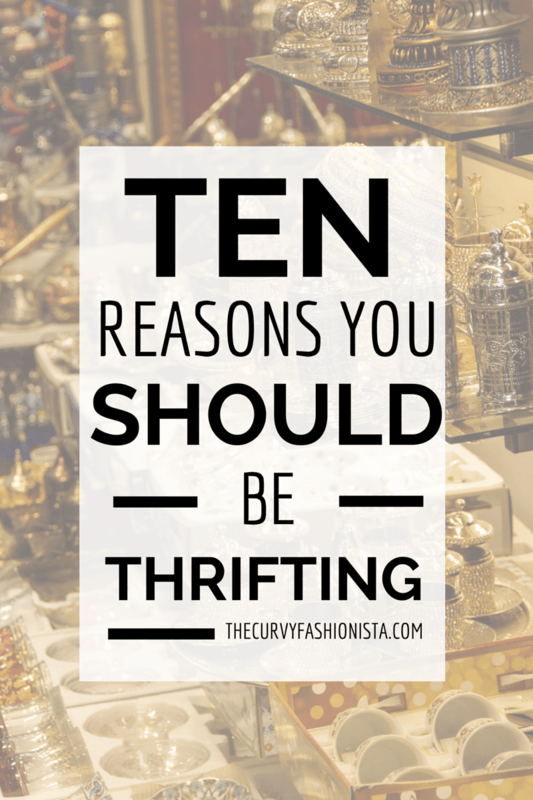 When was the last time you visited a thrift store? Let’s talk about it! Do you agree with our rules? Thank you for sharing!!! 🙂 I will check it out! WOW! That sounds amazing! Thanks for sharing!